Hold your locks back with The Vintage Cosmetic Company Pippa Make-Up Headband; a stylish yet practical accessory to ensure no product reaches your hair. Crafted from super-soft fabric with an elasticated band and an all-over pink star design. Perfect for keeping hair out of the way when applying makeup, starting your skincare regime, or relaxing with a face mask. 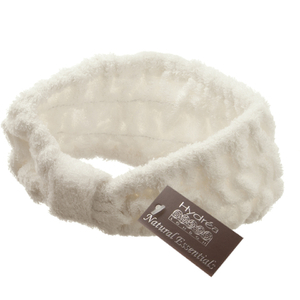 Pull headband over head so it is around your neck then pull up and push hair back.